Rio Ferdinand, Carles Puyol. Top class elegant defenders, who makes effective defending an art. Defending don’t have to be rough and unsightly. We shall look at the 2 methods of winning the ball, effectively and calmly. Time to reverse the role and make a fool out of the attackers. Irritated by all those flashy tricks? What better way to stamp you authority with a sliding tackle. Yes, there are sliding tackles to crunch your opponent and leave them in a heap of mess (That’ll show them! ), and there are those that wins the ball back perfectly, leaving the striker red-faced. Sliding tackles are best used in the middle of the field. Even if you missed, there are still back-up in defence. Sliding tackles are often seen on the flanks as well. And they should be avoided in the penalty box. Yes it is hard to win a penalty in PES nowadays, but it is still very easy to give one away. To do a perfect sliding tackle in PES, you have to run alongside the dribbler. Be calm and wait for the chance. Once your opponent knocks the ball forward, go in for the tackle. You will get the ball, the dribbler will skip over you. And you counter attack. Mindless chasing back and tackle is not only ineffective in a PES match, it makes you look like a headless chicken. We have talked about sliding tackles, now let’s move on to standing tackle. 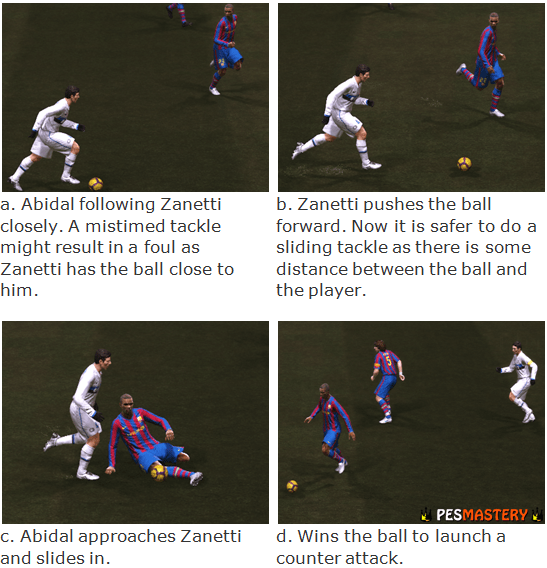 To tackle the ball with calm and precision, hold the PES Special Control button (R2) and follow your opponent. This activates the PES Jockey Stance. This stance makes your defender more alert and balanced, making it harder for anyone to dribble past you. You can use this to channel opponents to the flank by obstructing the easy path to goal. Stay calm and wait for your opponent to approach you. Once he is close enough to you, go in for the tackle. It will be clean and strong. Any flashy tricks he execute is ineffective and will only cause him embarrassment as you can simply step in to take the ball away. Use these 2 defending methods in your next PES match, especially the jockey stance. It is a very effective technique to close down on your opponent and create an imposing figure. Once he moves in towards you, tackle him with either a stylish sliding tackle, or a simply standing tackle. Gloat and start your counter attack. I have a question mate. If I have some questions to you about PES gameplay (which I play on PC), or any topics that I’d like you to see to consider as next posts, how can I contact you, any e-mail or something you prefer? Thanks for your encouragement! Really glad I could share these tricks with you. Sure you can contact me anytime, either through any of these comments, or through email. I believe you subscribe to my PES Mastery Ezine? Have you been receiving the first few issues? You can always reply to that email address and I will take the time to reply you personally. Hope you are having a great time with your PES, and enjoy watching the World Cup too ! Don’t worry we players will improve over time! I think the first thing to successful defending is to keep calm. You can try holding ‘Special Control’, which is R2, to activate jockey stance and follow the dribbler, and wait for him to commit a mistake before going in to tackle him. Great website, I really enjoy it…thank you so much for all guide friends.. Thank you for your advices. Extremely useful. Hi Neo, been reading your site for a while and im impressed man. Just have some questions if you dont mind. I am playing PES 2011 for PC and Im playing ML with Bayern Munich at the moment. I used 4-3-3 formation like you mentioned in your posts and I am too lazy to control all the players so I turned on Coach Mode. Now the point is if I put difficulty setting to the hardest one (forgot the name I think its above Professional), Its always 0-0 or I lose. I have to revert to Regular to get a decent score, but sometimes I lose and sometimes its a draw. Can you explain about the Coach Mode and are the AIs not that good or what? I bought a GK from Ukraine with a 95 OVR but he gets owned by CFs lol. Please tell how to Jockey the defender? You can hold R2 and follow the defender. Your player will adopt a jockey stance. 1-1 GOAL WİTH KEEPER WHEN SHOOTİNG THE BALL EVOLATİON ALWAYS HİGH AND CANT GET GOAL ? CRAZY ABOUT İT WHAT I MUST HAVE TO DO WHEN SHOOTİNG ? I THİNK MY FAULT PRESSİNG DİRECTİON L3 FORWARD+R1 DRİBLİNG BUTTON HOLD STİLL ..
Can anybody tell me how to stop a player pushing me off the ball. You will have to push the opponent back by pushing your right stick in his direction. The strength of both players will determine who wins the physical battle.